Shahir Masri is an air pollution scientist at the University of California, Irvine, and also teaches at Chapman University. He earned his doctoral degree in the field of environmental health from Harvard University, and his Bachelor of Science from UCLA in environmental science. Follow him on Twitter at @shahirmasri or Instagram at @Dr.ShahirMasri. As major climate reports continue to warn of impending and irreversible climate catastrophe, our window of opportunity to ensure a safe and habitable future is shrinking. Given this reality, I knew two years ago that I had to do something more than just work as a scientist. I had to think of a way to communicate science to the public and help mobilize action on climate change. It was at a 2017 Citizens’ Climate Lobby conference when I finally decided I was going to pause my research career and do something bold about the climate. My then-girlfriend (now fiancée) Athina was equally motivated. And on August 1st the next year, we left the safety of our jobs and set off together “On the Road for Climate Action,” a phrase that became the title of our grassroots project to travel the country and speak to communities about the causes, impacts, and solutions surrounding global warming. Across the nation, we spoke with communities who have experienced climate impacts of nearly every shape and size. In Nevada, people spoke of increased heat waves. Though the state already gets triple-digit heat, Las Vegas experienced an extra two weeks of triple digit weather in 2016. In Utah, communities complained of declining air quality as wildfires have become increasingly prevalent. We experienced this firsthand as the first week of our journey was accompanied by a haze from what would become California’s largest wildfire on record. We were enshrouded by this smoke all the way through Wyoming! The bark beetle too was a concern. In Colorado, rangers led us through devastated forestlands where the bark beetle has wreaked havoc thanks to warmer wintertime temperatures and drought. Farmers in the Midwest told us stories of erratic weather patterns that are making it difficult to grow crops. One farmer in Minnesota spoke of 17 inches of rain that fell in a single day, wiping out his neighbor’s potato crop. Upon visiting a Native American community, we learned that mobile homes are periodically getting destroyed by softball-sized hail which, according to a local, never used to grow larger than golf balls. Throughout the East and South, concerns expanded to include sea level rise and hurricanes. In fact, we passed through the Florida panhandle only three days after Hurricane Michal set a new record as the largest hurricane to hit the region. Michael was not a storm that cleared buildings, it was a storm that cleared forests—literally snapping trees like toothpicks. The sight was shocking. For years, climate scientists have warned that warmer temperatures will mean more intense hurricanes. Well, many people are now taking notice. We certainly took notice. The stories we encountered from our three months on the road were truly endless. It was sad to see the wreckage that climate change is already causing across the country. Many of the stories I’ve described are those of residents who have lived in these areas for generations. They know their local climate. And they’re observing it change. Part of our project’s importance is to share these stories, so people can see that climate change is more than just “parts per million” or “future consequences.” It’s people’s lives and livelihoods. And it’s happening now. For more stories, including video interviews with scientists, community members, and others we encountered, visit our blog page. Going on the road for climate action is something we feel was worthwhile. But we believe our work is far from over. Thus, we’ve decided to launch Part II of our project this spring—a climate outreach campaign across the Northwest that will target 16 cities over 6 weeks. We haven’t figured out how we’ll pay for it, but we think the work is too important to stop. 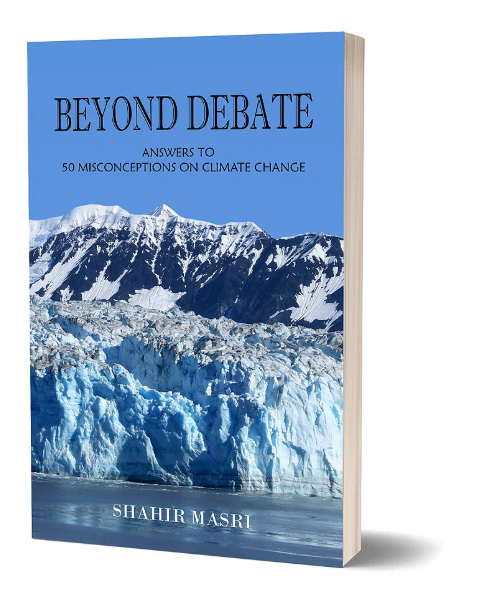 You can support our work by purchasing my new book, Beyond Debate: Answers to 50 Misconceptions on Climate Change. All book purchases made through my website go to supporting our climate outreach work. To learn more about my book and climate project, visit www.RoadForClimateAction.com.